LIFE WITH DOG is an incredibly well directed, well-acted movie by Corbin Bernsen about a man suffering severe grief after the accidental death of his beloved Christian wife. LIFE WITH DOG is an incredibly powerful, raw, courageous, unrelenting look at a man’s soul with a strong Christian worldview, but the ending leaves some questions unanswered. 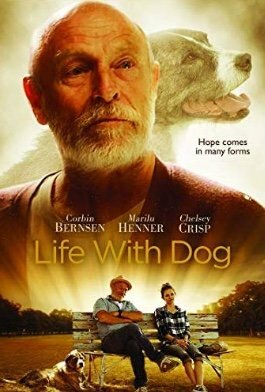 LIFE WITH DOG is an incredibly well directed, well-acted movie by Corbin Bernsen about a man suffering severe grief after the accidental death of his beloved Christian wife. The movie opens with the drone shot of an accident scene where a woman riding a bicycle has been hit by a hit-and-run driver. At the end of the accident scene, there’s a dog sitting patiently on the pavement watching the paramedics and police. Cut to Joe sitting in his dark, dingy, dirty living room weighed down by his grief for the loss of his beloved wife, Alice. Joe doesn’t even want to answer the door and presumes wrongly that the person is a developer who wants to steal his house to convert it into an apartment building. The knocking, however, turns out to be his daughter, Zoe, who’s concerned about her father. Joe is gruff, mean, sarcastic, and cynical with Zoe, although he makes a few statements that he loves her. He explains that he thinks the real estate development company building an apartment complex across the street killed his wife so they could steal their property. After he drives Zoe off, he tells his late wife he’s going to water the roses. When he does so, he finds out that a mangy terrier dog has managed to sneak into his yard. No matter how hard he tries, he can’t get rid of the dog. When Norman, the real estate agent representing the development company, finds out how much Joe wants for the property, Joe pulls out a gun and accuses Norman of killing Alice. Alice in his fantasy memories tells Joe to stop doing such foolish things. The police come to arrest Joe for threatening Norman. At the police station, his daughter, Zoe, gets Joe to promise he’ll talk to her pastor, Frank. When Frank visits him, Joe gets angry, refuses to let Frank talk about God, and finally says his wife was Faith and he is Doubt. Joe says he tried twice to find God. When his 13-year-old son was dying, he actually prayed but nothing happened, and his son died. The second time he tried praying was when his wife of 43 years died and nothing happened. In his grief, Joe comes up with a new villain, the bank that’s sending him mortgage payment notices. He threatens the banker, telling the banker that he knows what he’s doing: he’s seizing Joe’s property so he could sell his property to the developer, so the banker must have killed his wife. Joe gets arrested again. The police detective promises Joe he’ll look into his wife’s accident. However, the dog leads him to the hit-and-run driver, and Joe brings a gun to take revenge. Will Joe kill the hit and run driver, who has a young wife and baby on the way? Will the police lock him up for good? Will he move beyond his selfish attitude to learn how to love God and love his neighbor? These and others are the poignant questions at the end of this powerful personal drama. LIFE WITH DOG is an incredibly powerful movie. It is a raw, courageous, unrelenting look at a man’s soul. This may be Corbin Bernsen’s best acting. It is definitely his best writing and directing. The movie would be a great box office success in the 1960s in the manner of WHO’S AFRAID OF VIRGINIA WOLFE? It could even be an Oscar nominee. However, the audience has moved away from psychological dramas to big action adventure, comic book movies. To get an audience today, you need to have not only action adventure but liberal amounts of humor. Except for DARKEST HOUR, which had the action of World War II, there are almost no movies making money at the box office on the order of MARTY, COME BACK LITTLE SHEBA or many of the other great psychological dramas of the past. Furthermore, the movie ends on a positive note, but also leaves a lot of ambiguous, soul-searching questions unanswered. It is not a clear come-to-Jesus conversion story. It is subtle and enigmatic. LIFE WITH DOG is an incredibly good movie. Hopefully, it will find an audience. Man constantly has visions where he talks with his late wife, but she’s not seen as a ghost or a supernatural character, dog becomes an instrument of God’s grace. LIFE WITH DOG is a powerful drama starring Corbin Bernsen, who also directed. Joe is grieving the loss of his beloved wife, Alice, who was killed by a hit and run driver. Joe tells his daughter’s pastor he’s tried praying to God, but nothing happened. Joe finds out that a mangy terrier dog has managed to sneak into his yard. No matter how hard Joe tries, he can’t get rid of the dog. Eventually, the dog leads Joe to the hit-and-run driver. Joe brings a gun to take revenge, but will he actually go through with it? LIFE WITH DOG is an incredibly powerful movie. It is a raw, courageous and unrelenting look at a man’s soul. This may be Corbin Bernsen’s best acting. It is definitely his best writing and directing. The movie ends on a positive note, but also leaves a lot of ambiguous, soul-searching questions unanswered. It is not a clear come-to-Jesus conversion story. It’s a compelling psychological drama. LIFE WITH DOG is subtle and enigmatic, but it’s an incredibly good movie. Hopefully, it will find an audience.